The trucking industry faces unprecedented challenges in a continuing effort to reduce the carbon footprint of the heavy-duty transportation industry, which is why companies like Citgo Lubricants are helping fleets prepare for the strict regulations. Citgo Lubricants has developed GreenWay, an initiative that takes on environmental stewardship issues and connects it with measureable economic savings and increased efficiency. 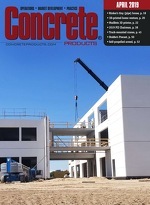 CyroCrete suits the most demanding cooling requirements and pour temperature specifications for concrete during extremely how weather conditions, notes developer Air Liquide.